In 2010, the U.S. Supreme Court invented a potent new right for corporations to spend unlimited money on elections. This decision will likely create a flood of corruption from giant campaign contributions, and strengthen corporate control of our politics and government. Congress and the state legislatures should approve a constitutional amendment prohibiting corporate spending in elections, declaring that corporations are not persons under the constitution and do not enjoy constitutional rights. To curb the dominance of big money in politics, we must raise the power of citizens in elections. Congress should approve democracy vouchers -- a $50 federal income tax credit for every citizen, for political campaign contributions to whichever candidates they choose. Since 1999, three major Supreme Court decisions have wrecked much of federal law against corruption. Congress should strengthen federal laws against bribery, illegal gratuities and honest services fraud to prohibit special interests from using gifts to curry favor with politicians. Congress should swiftly pass legislation to prohibit former Members of Congress and their staff from lobbying on behalf of any commercial entity. The U.S. House of Representatives and Senate should pass ethics rules to prohibit Members of Congress from providing influence or official action in exchange for campaign contributions, gifts or other consideration. The House and Senate ethics committees have been reticent to investigate powerful Members of Congress and to punish wrongdoing. This has led to a climate in Congress where corruption is increasingly possible. Congress should invigorate the House and Senate ethics committees by ensuring that outside counsel will investigate ethics complaints against Members of Congress, restoring citizens' ability to file ethics complaints in the House and making the ethics process more transparent. Members of Congress and their staff should be barred from accepting for private benefit any gifts from lobbyists or the general public. Special interests with matters pending before Congress should not be able to pay for congressional travel, nor should political committees or charity golf or tennis tournaments be used as conduits to evade the current prohibitions against payment for Members’ recreational travel. Congressional earmarks – spending provisions inserted into appropriations bills — have turned the appropriations committees into "favor factories," as corrupt lobbyist Jack Abramoff reportedly called them. The practice of earmarking should be permanently banned. The Federal Election Commission (FEC) is crippled by built-in two-party partisan gridlock, investigative lassitude, institutional design and financial starvation. Congress should replace the FEC with a wholly new enforcement scheme for federal campaign laws. Congress should place its most useful documents on the Internet, including texts of bills, draft committee and conference reports, a searchable database of congressional voting records, and Congressional Research Service reports. The House and Senate should strengthen their conflict-of-interest rules to ensure that Members do not enrich themselves by their own official actions, and that the judgment of Members of Congress is not impaired by their own financial holdings. 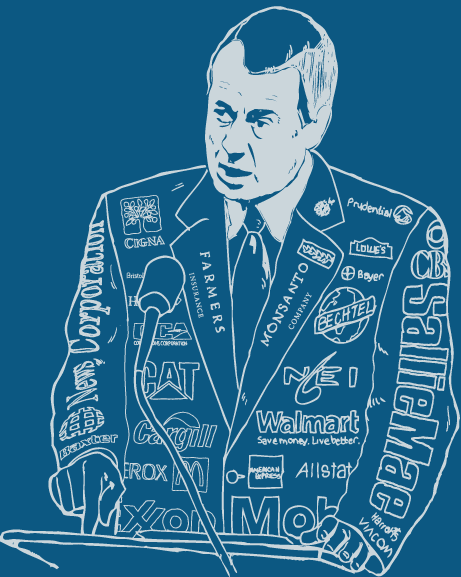 Purchase your own 11" x 17" copy of the John "The Wheelman" Boehner poster. $15 with shipping included. U.S. only. This is a project of Center for Study of Responsive Law.